"You've got mail!" Chain mail that is. 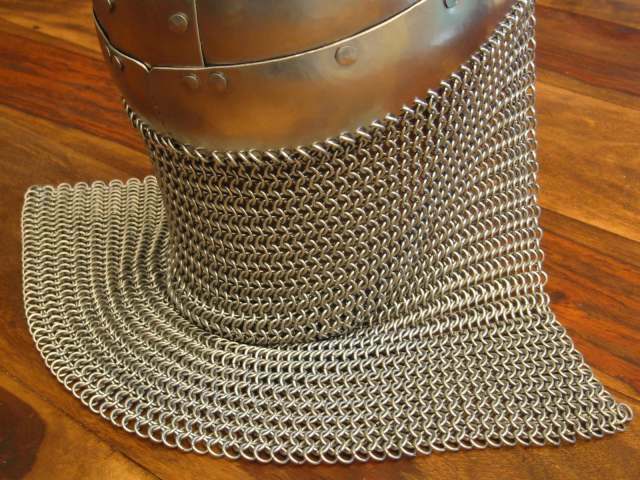 Using a few simple tools and the knowledge of the ancients, it is possible to make your own armor and chain mail. 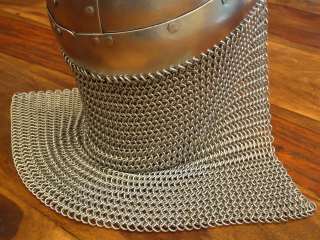 This article shows a beginner how to make a sheet of chain mail which is attached as a curtain to the sides and back of a steel helmet. 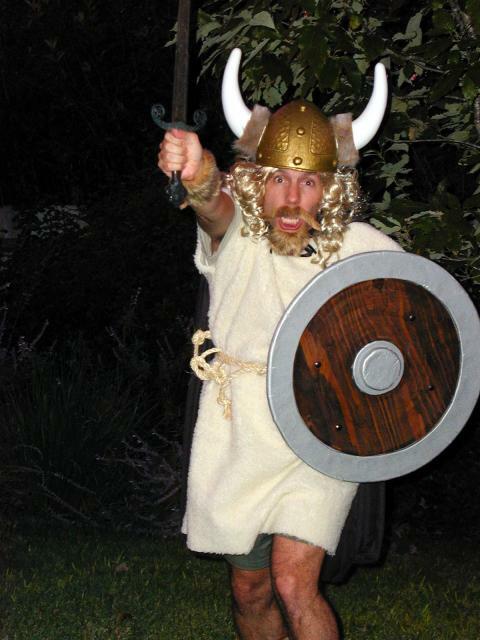 To get ready for Halloween, I decided to improve on last year's Viking beserker costume and make something a little more authentic. Since I love the ancient time period of the first millenium, I decided to become an early Anglo-Saxon warrior. 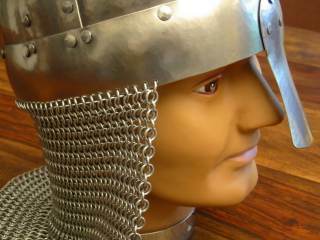 The first part of the costume would be a helmet like that of an Anglo-Saxon nobleman in battle. 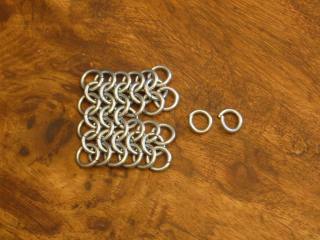 Chainmail is lots of fun to hold and wear, but it is tedious to make. About 1 square foot of chain mail takes me about 8 hours to make. However, if you are watching football or movies, the time is no problem. It reminds me a bit of knitting in steel. Once you get the hang of it, the rings seemingly fall together to create a beautiful sheet of flexible steel. Learning the process is not very difficult and does not involve dangerous tools. I think even 8 year olds can make their own mail provided you use a simple pattern and a light enough gauge ring. The helmet shown is a steel Spangenhelm which was popular with Anglos, Saxons, Jutes, and Vikings in the years 200 - 800 A.D.. Although I attempted to build my own, I eventually found it more worth my while to purchase a basic Spangenhelm from Joe Piela at the Lonely Mountain Forge in Pennsylvania. Although the manufacturing time is long (on the order of months), the quality of the work is excellent and the price is far less than anything I could do on my own. 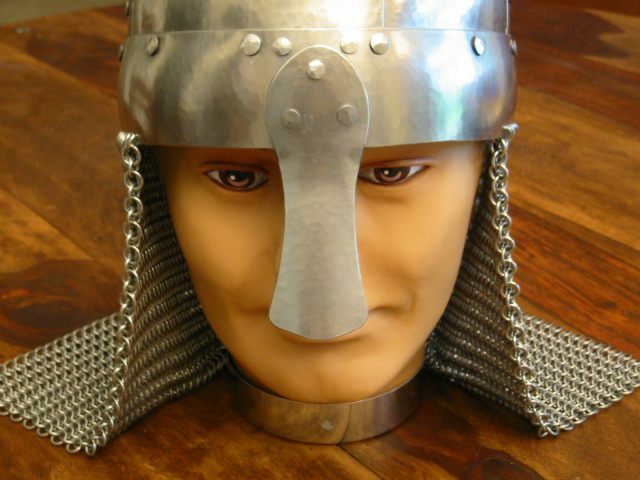 The steel helm in the picture cost $100 plus shipping. 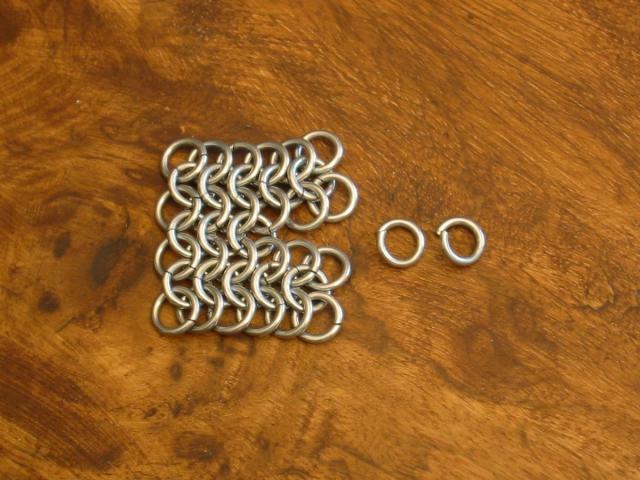 To make the sheet of chain mail, one must start with only very basic tools and supplies. Here I show the two pliers I use, one curved and one straight, which I purchased from Sears. The curved one is useful for making slight twists as you bend the rings. You can make your own rings or purchase them online. In the olden days, rings were made by wrapping wire around a steel pipe or mandrel and winding the wire in a helical fashion. The wire was then sawn or cut to form rings that are circular, but instead of meeting at the ends have an offset to form a slight ramp or coil. The rings in the photo were purchased online from Miron's Mail Manufactury. They are sawn so they don't have the pinched tips that you get if you use a diagonal wire cutter. They are tumbled in a barrel to give a nice silky sheen and remove any burrs or sharp edges. The rings shown are 1/4 inch 16 gauge galvanized steel. You can also get larger or smaller diameters, thicker or thinner gauge, and many materials - brass, copper, aluminum, or nickel silver. 16 gauge requires adult strength to bend. If you have weaker hands, or are doing this as a project with your kids or the Boy Scouts, I suggest you use 18 or 20 gauge steel, or the easier-to-bend copper, aluminum, or brass. I know after 2 hours of bending I had to take a break and rest my hands. Also, consider larger rings. You can make larger sheets faster with a bigger diameter. 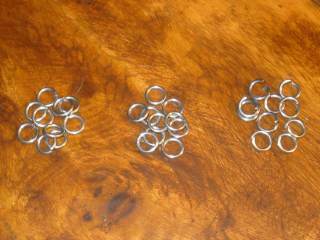 First you must take the raw rings and make a sets of open and closed rings. The photo shows the raw coils at left, closed rings in the center, and open rings at right. 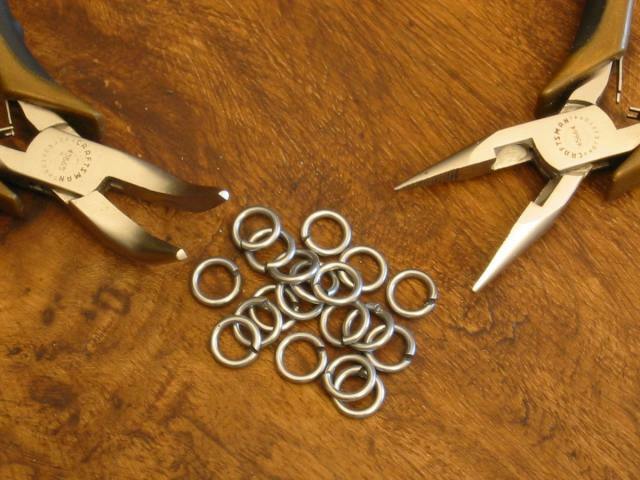 Make equal batches of open and closed rings. I like to work in sets of 20 to help count my progress. For a sheet of mail 80 rings wide (about 2 feet), this allows you to say "quarter done", "half done", and "almost there." When you close the rings, give a slight twist to help completely close the ends and make them touch. This will prevent the slight gap from snagging your hair. Ouch. The open rings need only be wide enough to allow another ring to pass. The pattern shown in this tutorial is called the "4 in 1 pattern." That's because one ring is interlocked with 4 of its nearest neighbors. There are other patterns shown at The Armour Archive. 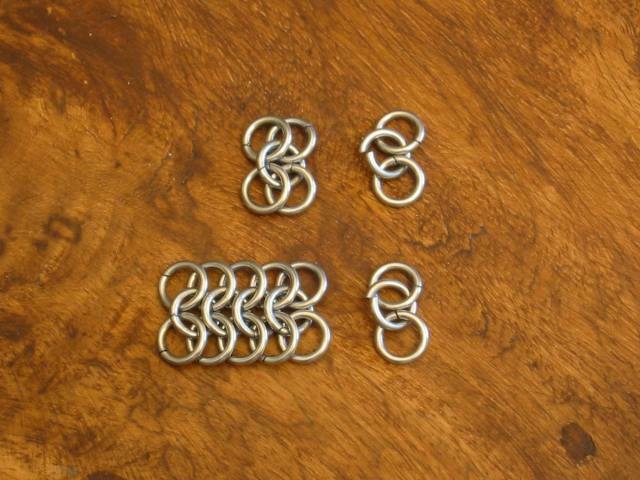 Another popular historic pattern was the "6 in 1" which is good for larger ring sizes. My method is to make long "ropes" of rings that are 3 rings high and then join these "ropes" to the completed work. You start a rope by taking one open ring and four closed rings as shown in the upper left of the photo. Lengthen the rope by grabbing one open ring and two closed rings as shown in the upper right of the photo. Push the end of the open ring through the two rings on the end of the rope. Use the pliers to twist the open ring shut. At the bottom of the photo is a rope of rings with another open ring about to be added. Notice that the rings lay flat in herringbone pattern. The odd rows lay with the left edge of the rings touching the table and the right edge resting on the next ring. The even rows lay with the left edge of the rings resting on the previous ring and the right edge resting on the table. Laying your work out on a flat table or table cloth will help you maintain the pattern. Be patient. Starting a rope is always the hardest part. Once you have a rope of rings equal to the width of your work, it is time to join the rope to its neighbors. 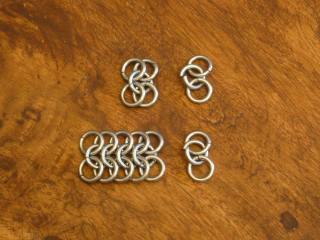 For this tutorial, the ropes in the photo are only 5 rings wide. As shown in the photo, lay your newest rope below your previously completed work. Take open rings and join two rings from the top rope to two rings in the bottom rope. The joining ring should lay opposite to the fashion of the two rows that are being joined. For instance, in the photo the top and bottom rope have an edge of rings that have their left edge touching the table. The rings that join these ropes will have their right edge touching the table. The photo shows three rings joining the two ropes and two more open rings about to be added. And there you have it! That is all it takes to create a sheet of chain mail. Of course you will want a wider and taller sheet if you are going to protect make a shirt or coif, but sheeting is the first step to fashioning something bigger. If you want to learn how to expand or contract rows, I suggest you read the advanced articles on The Armour Archive site. This photo shows my completed helm with the attached chain mail. 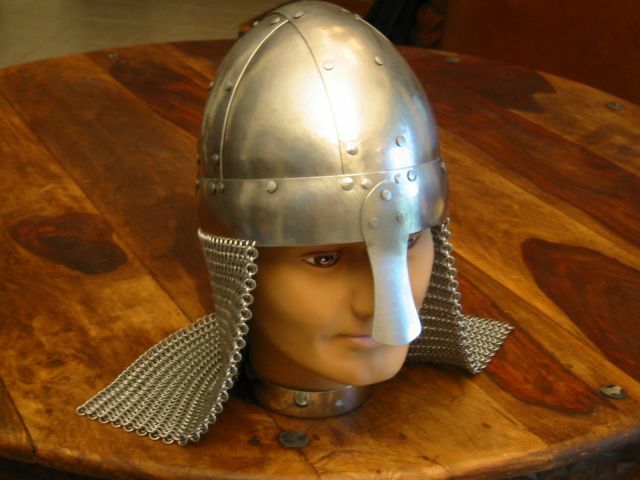 Once again, the Lonely Mountain Forge spangen helm is a beauty. It is made of a head band with two crowning bands, and four triangular spangens riveted to the bands. It also has a simple noseguard riveted to the headband. The helmet has a nice hammered finish and some very neatly hammered rivets holding it all together. The chain mail sheet is about 2 feet wide (80 rings) and 16 inches tall. Most Vikings and Anglo-Saxons did not have this curtain, instead going with the more basic helm without a curtain. Others wore a coif underneath the helm. I went with the curtain because I saw some artwork with this helmet, and then a photo on a renactor's site, and then I was hooked on the design. To attach the mail to the helmet, I simply drilled holes in the head band of the helmet. I used a steel punch to create a dent to start the hole so the drill bit would not walk from its intended position. Once the bit went through the band, I angled the drill to the side so the rings would rest in the proper slightly diagonal orientation. I did not measure the distance of the holes, but rather started with the middle of the sheet at the back of the helm, and held the chain mail sheet to the helmet to eyeball the next 3 or 4 holes. Here is a view of the helmet from the back. You can see how the mail drapes off the helm like a curtain. I think the armorer's term is an aventail. Steel is heavy! I would say it all weighs about 14 pounds, about the weight of a bowling ball. Since the inside of the helmet is unfinished, I will wear it with an arming cap or knit watch cap. Thanks for reading, but check back in a few weeks. I hope to have more of my Anglo Saxon costume done. 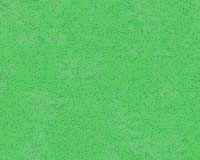 Last modified: Thursday, 09-Jun-2011 13:03:09 MST.